Thingvellir National Park is a cultural landscape representing mediaeval Norse/Germanic culture. It lies in the the southwest of Iceland near the peninsula of Reykjanes and the Hengill volcanic area. The valley is one of the most important places in Icelandic history. In the year 930, the Althing, one of the oldest parliamentary institutions of the world, was founded. The Althing met yearly, where the Lawspeaker recited the law to all of the gathered people and decided disputes as well. 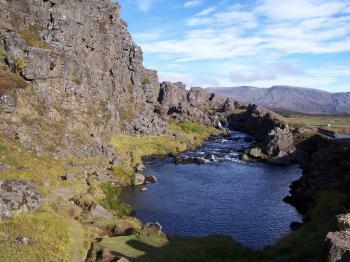 Criminals were also punished at these assemblies; to this day, visitors can see the Drekkingarhylur ("drowning pool") in the river, where woman lawbreakers were drowned. This could probably be said of all World Heritage Sites, but a little bit of research makes a huge difference for how you'll experience Thingvellir. If you do the standard stop-off along the Golden Circle, you'll see a very nice view across a scenic valley (assuming the weather is clear, which is a big gamble based on my admittedly limited experience in Iceland), a lovely waterfall, and, if you go to the gorgeous new visitor center, an excellent introduction of the geological, ecological, and cultural importance of the park. 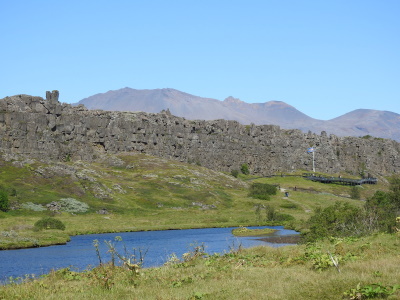 But Thingvellir (and, really, Iceland in general) is a place that deserves a deeper dive. Read up on the geology of Iceland before you go. Given that most of the world's plate boundaries are underwater, it's rare enough to be able to walk between continents (as you can do here), but to be able to stand atop the world's longest (and mostly submerged) mountain range, the Mid-Atlantic Ridge, is an even rarer opportunity (your choices are basically Iceland and the Azores). As one of the only large islands in the North Atlantic, the flora and fauna of Iceland are isolated and unique, and Thingvellir is one of the best places to see both (especially the flora, though I understand that this is one of the few places near Reykjavik where you can see Arctic foxes, which I sadly did not). Above all, if you want to make sense of Iceland, read its literature to understand why Thingvellir is the beating heart of the nation. Ireland is the only other country I've been to in which the written and spoken word bear as much weight as they do in Iceland. If you're very bold, read the Icelandic sagas before you go (or visit the Culture House in Reykjavik for the abbreviated versions and a look at some of the original manuscripts), but at the very least I can strongly recommend the work of Halldór Laxness, Iceland's only Nobel laureate, who lived just down the road from Thingvellir. All the tourist literature will tell you that Thingvellir was the site of the island's Viking Age parliament, which is true. What's remarkable is why it was chosen for that purpose, and why it has remained the site of major events in Icelandic history from the adoption of Christianity to the foundation of the modern republic: the cliffs there make a natural amplifier, meaning that speakers could be heard by a wider audience. Literature, law, and the landscape are the three major forces that shape Icleandic culture, and that Venn diagram overlaps most obviously and most spectacularly at Thingvellir. If the truth be told, though, other World Heritage Sites are more visually spectacular, and the importance and gravitas of the site are easily missed without some study. The payoff, though, is that doing your homework in advance will never pay off more lucratively than at Thingvellir. A couple of random tips: if you can help it, don't do one of the tour bus trips from Reykjavik. Renting a car and allowing yourself a full day here is worth it. I particularly recommend the back road (roads 435 & 360 from Reykjavik) which take you through some breathtaking and almost entirely deserted scenery. If you're pressed for time, the visitor center, Lögberg, and Öxaráfoss waterfall are all doable fairly quickly and are all rewarding. I took extra time to hike to some of the ruined farmsteads on the valley floor, which I also recommend. Not only does it give you the chance to walk between Europe and North America and to see firsthand the relationship between nature and culture in Iceland, but it's a great chance to get away from the crowds (which can be a bit overwhelming at the top of the cliff) and have a corner of this unique World Heritage Site to yourself. 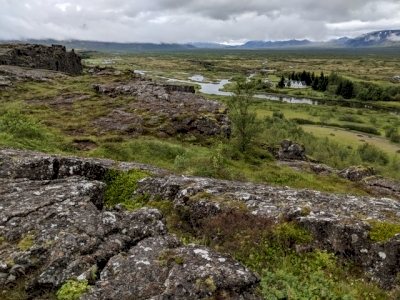 Thingvellir National Park has to be one of the most geologically fascinating sites I have visited, sitting atop the rift between the North American and the Eurasian tectonic plates. It isn't the geology on its own which got this park inscribed as a World Heritage Site, though it provides a stunning backdrop, particularly in winter as the black basalt cliffs stand in stark contrast to the snowy plains. But the geology is what made this an ideal site for the founding of the Althing, the oldest parliament in the world, which met at Thingvellir annually. At the base of the cliff formed by the edge of the North American plate is a rock outcropping the Icelandic people call the Lögberg, or Law Rock, which is now marked by an Icelandic flag. Here, the legislature would meet, and the law would be read to the people gathered on the plains below. The assembly was open to all free men, who would bring their families and camp on the fields of the rift valley in what must have been an incredible social gathering. The Althing no longer meets at Thingvellir, having moved to the Icelandic capital of Reykjavik almost 175 years ago. Still, Thingvellir National Park is a stunning site to see, and, after having visited the site this past January, I would love to return to see it in summer. 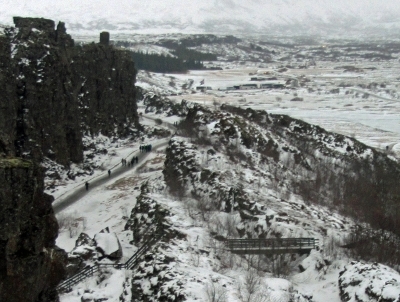 Logistics: Thingvellir National Park can be reached by numerous tours operating out of Reykjavik or by private transporation; there are numerous trails on site, as well as parking lots above and below the Althing site. This was a really interesting and rewarding place to visit and as Paul Tanner states is an essential part of any trip to Iceland. We visited on a beautiful late September day when the bright autumnal colours were staring to show, and it made this a great experience. Though somewhat intangible the relationship between the natural and cultural aspects of the site are very noticeable. The rift between the Eurasian and North American plates provide a large plain, ideal for the purpose of annual meetings whilst the banks of the plates themselves provide a great point from which to survey the whole area. The relationship between natural and cultural factors is something very noticeable in Icelandic history and culture, but this is one place where it is very evident. The importance of the site historically is very important being the site of the world’s oldest Parliament, this being essentially the first political institution of the European ‘New World’. In terms of remains there is not much to see, just outlines from the walls of Buð small temporary booths used as houses when the Alþing was in session. There is a also a small church. The drive out from Reykjavik is very nice, being well sign posted, and with some great scenery in the distance. The mountains and glaciers tantalise with glimpses of the more rugged natural delights that Iceland’s interior and North West Coast hold in store. On the same day we also visited the spouting hot springs at Geyser, the Kevið crater, Skalholt Church, Sigur Rós’ recording studio at Álafoss, and the magnificent waterfalls of Gullfoss (perhaps my highlight of my all too brief view of Iceland). These can mostly all be viewed on the ‘Golden Circle’ tours running from Reykjavik, though it worked out better for us to hire a car. This also enabled us to round of the day watching the sunset over Reykjavik from the hot-pots of the Árbæjarlaug swimming pools, the perfect way to round off one of the best days of travelling I have ever had. a. Geology – this split in the rocks in the photo is the Mid Atlantic Ridge which runs across Iceland as it spreads at around 2 metres per century (Near Myvatn in the north there is a rather nice piece of evidence of this as a water pipe has been parted as it crosses the gap! )"Interesting" as this scenery might be however it is worth noting that it is NOT relelvant to the inscripion of this site which is inscribed on PURELY cultural grounds as a "Cultural Landscape"! b. History – the site of what claims to be the oldest parliament in the world (starting in 930). The Icelanders gathered here once a year and the Speaker of the Parliament would stand atop the Logberg, or Law Rock, to read the law to the members in the valley below to the left. These are the aspects which Iceland and UNESCO (via ICOMOS) consider make this location a place of universal value! If you haven’t got your own transport there are daily trips taking in Geyser as well. 3.0: Gary Arndt Solivagant Craig Harder RobRos Peter A. Places of Execution: "Drekkingarhylur ? Drowning pool - Guilty women were put in sacks and drowned in Drekkingarhylur while men were beheaded or hanged..... This obnoxious practice remained in effect until 1838." Locations of significant drownings: There were 70 - 80 executions in Thingvellir from the 17th century onwards. Of those there are recorded 15 hangings, 30 beheadings and 18 women were drowned in the so called 'Drowning Pool' which was where the bridge across the river is now. It is the only place of execution which is marked by a memorial plaque but there are also places at Thingvellir with self-explanatory names such as Gallows Rock (Gálgaklettur), Scaffold beach (Gálgaeyri) and Burning gap (Brennugjá).